I'm back with a design that brings new meaning to Read and Roll. No, not the toilet paper holder/magazine rack I told you about earlier this year. This time it's a bookcase chair on the go. 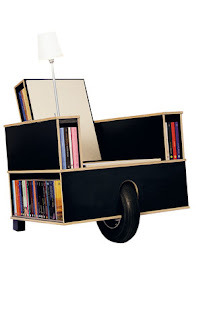 Yes, a bookcase chair. The Bookinist, designed by Nils Holger Moormann, had shelves to accommodate your favorite books. No more searching the house to figure out where you left your book...you can easily reach behind the headrest or under the seat to find the book you're looking for. If you get tired of sitting in a certain spot, simply roll the chair wheel barrel style to a new location. Bonus: there's also a secret compartment for storing odds and ends! I'm pretty sure I couldn't afford the designer version of the Bookinist chair, but looking at the design, I think it's a doable DIY, depending on your skill level and patience. I'd probably leave out the giant wheel in favor of four casters or plain old fixed legs. I'd also add a more comfortable cushion and ditch the tacky lamp. What do you think? Cool idea for a chair. I like your version even better! I agree, ditch the lamp, give it a comfy cushion, and 4 big casters would look better than the one big wheel.